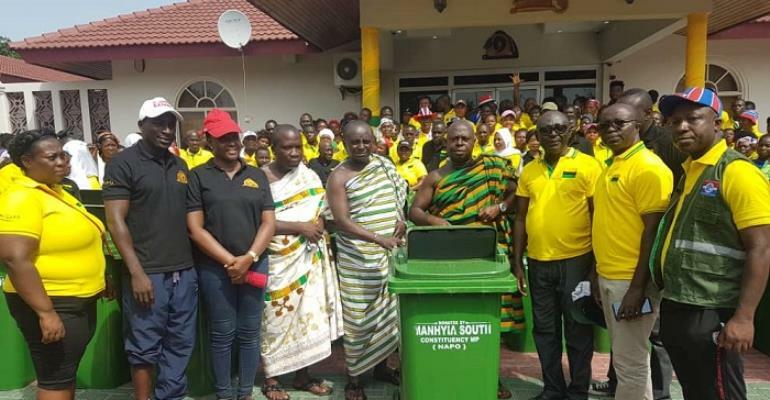 Member of Parliament for Manhyia South, Dr Matthew Opoku-Prempeh, aka ‘Napo,’ the Member of Parliament (MP) for Manhyia South Constituency, has donated 50 new dustbins to the Manhyia Palace. He donated the items to support the celebration of the 20th Anniversary of the ascension of the Golden Stool by Asantehene, Otumfuo Osei Tutu II. The green dustbins would be placed at vantage points at the palace, especially during the grand durbar to mark Otumfuo’s milestone this coming Sunday. This would go a long way to help improve the sanitation at the palace, as thousands of people are expected in the city in the coming days. The executives of the Manhyia South Constituency New Patriotic Party (NPP), led by their Chairman, Kofi Anane, donated the items on behalf of Napo who is currently overseas. The Saamanhene, Nana Osei Kwaku III and Buabasa, Nana Adbofuor Kwaw, on behalf of their overlord, the Asantehene received the dustbins on Saturday morning. Nana Osei Kwaku III, the Saamanhene, commended Napo for donating the dustbins to help improve sanitation during the celebration. “The kind gesture by Napo shows that he has issues concerning Otumfuo at heart and should sustain his good works,” the traditional leader stated. Prior to the donation, the NPP Manhyia South Constituency executives and hundreds of other members of the ruling political party held a clean-up exercise. The Kumasi Mayor, Osei Assibey and Francis Adomako, Ashanti Regional NPP Organizer, took part in the clean-up exercise which was held near the Manhyia Palace. Francis Adomako, the Ashanti Regional NPP Organizer, said Napo’s extraordinary leadership style had helped to make the NPP formidable in Manhyia South. Haruna Alhassan, the Manhyia South NPP Constituency Secretary, gave assurance that they would sustain their good works after Otumfuo.